By Jeffrey A. Rendall, Photos by Jeff Smith. 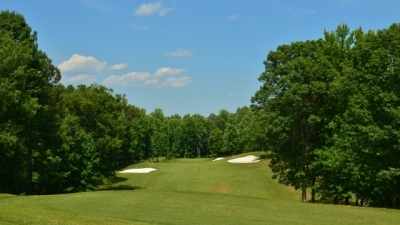 STAFFORD, VA -- Augustine Golf Club’s named after a Washington. From in back of the 1st green, you'll see the split fairway and elevated tees. Quite a view. No, it's not named after George, and it's not coined after the Nation’s Capital that's about 45 minutes north up I-95. It's not even named after the State of Washington. It gets its name from the father of the father of our country. It's a good thing that the golf course itself isn't that perplexing. 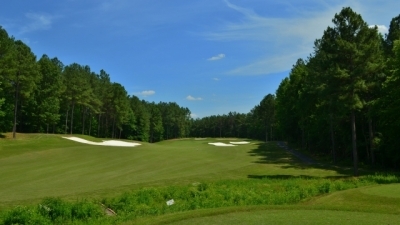 Augustine Golf Club is a Rick Jacobson (formerly of Nicklaus Design Associates) design, and features all the characteristics that his work is known for -- fair challenge, aesthetic beauty and most of all, playability. 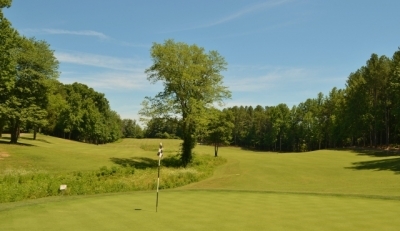 Augustine's par threes are a classic Virginia set -- water, wetlands and woodlands. Here, the 167 yard 17th hole. 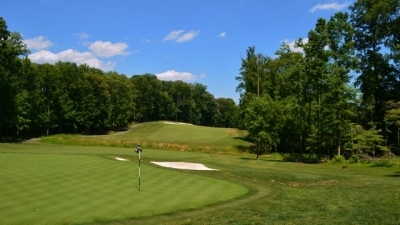 Opening in 1995, the beautiful Augustine golf course and housing development is given much credit for leading the upscale public golf course construction boom in the Washington, D.C. area that continues to this day -- to the delight of area golfers. The proximity of the track to the Capital metro area, combined with its serene parkland setting, guarantees that most local golfers put the course high up on their 'must play' list. 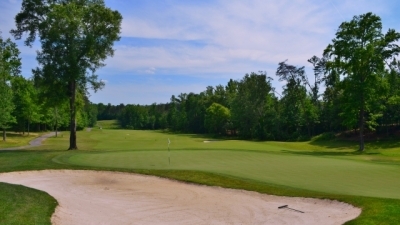 Visibility's the rule at Augustine Golf Club -- the uphill, left to right par four 7th hole strongly suggests a fade off the tee. 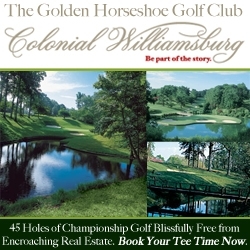 The land that Augustine Golf Club occupies was once part of the estate of George Washington's father, Augustine. Hence, the developers decided to make a permanent tribute to the man who served as a ‘role model’ to George. The analogy might be a bit stretched, but Augustine Golf Club could easily serve as a ‘model’ on how to make a public golf facility work. 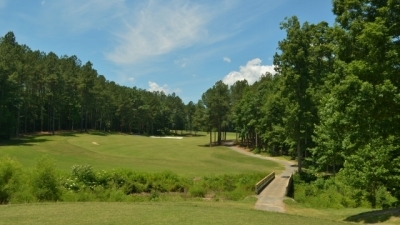 The course plays to 6725 yards from the back tees, and a par of 71. Tim Ganse, Augustine's Head Pro, puts it succinctly -- "We've got one of the best layouts on the east coast. 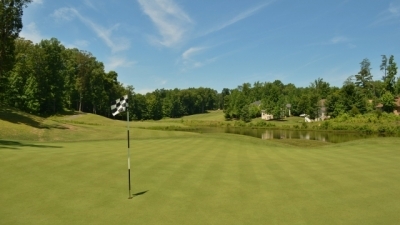 It's almost always in great shape; our service is in top form; the course is challenging, but fair. We want to make sure that every golfer's trip here is the best day that we can provide." The layout is sneaky challenging. Jacobson's done a masterful job on framing the holes -- and placed alongside his other major Northern Virginia work, Bull Run Country Club (in Haymarket), confirms that he has an extremely keen eye for the way a golf hole should be laid out. A photographer should do so well with a set of proofs. The tough par four 2nd hole will challenge you with water on your tee and approach shots -- but you'll know exactly what you're supposed to do on each. “The putting surfaces are fairly undulated, so from a player’s standpoint, you need to stay in play off the tee so you can control where you’ll place your approach shots – otherwise you’ll be on the wrong tier or on the wrong side of the hole,” Ganse added. The 18th hole is a fairly tame par five -- reachable in two for mid to long hitters. A great way to end the round. As Ganse alluded to above, the course fits extremely well, quite the masterful framing job from Rick Jacobson. Making Jacobson's framing task more difficult was the nature of the ground. As is true for almost every course in the area, there’s serious topographical variation. A fancy way of saying -- it's hilly, man. There just aren't many flat pieces of ground to work with. And although it can be said that golf architects move the earth to shape a course -- the best ones take what they're given and use it to provide contrast and variation. That's exactly what Jacobson's done with Augustine. Looking at the par four 16th hole, you'll see how Jacobson's hole framing is near perfection. The course actually plays shorter than the listed yardage, but doesn't play easier. Most of the tees are elevated, and there are only three par fours over 430 yards from the back tees. The fairways are certainly not skinny, and the forest really shouldn't come into play unless you miss one badly (as Ganse hinted at). This being said, Augustine’s difficulty lies in the placement of the hazards and through creative bunkering. Streams, ponds or wetlands intrude on numerous holes, and ensure that you're honest when taking shots at the layout. Close runner-up for signature hole honors is the par three 6th hole. Looks like there's a lot of water, but it doesn't really influence play that much. Though hardly a target course, proper placement on drives and approaches is essential to shoot low. The greens are small and mildly undulating, but are pretty quick. Every part of the short game is put under the microscope. Better hope that doesn't reveal too much. There are a few holes where you can't see the flag from the tee, but there are no blind tee shots. Every driving hole can use good distance. Jacobson's courses allow you to bring your driver, and use it. If the designer had anything to say about it, Callaway would never want for sales. 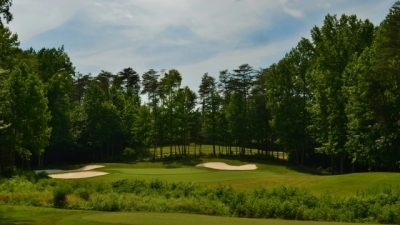 In recent years, the course has also acquired a reputation for poor conditions -- and as a result, underwent a complete renovation in 2011. Ganse describes it: " we did a complete remake of the greens, fairways, roughs, bunkers, and tee boxes. Thousands of trees have been removed to not only increase the playability of the golf course but also to help maintain the quality of the turf grass. The 399 yard Par 4 9th hole requires a tee shot to a slightly elevated landing area. From there, a tough shot into a well protected green. "The golf course wasn't alone in the renovation process. From the paint, to kitchen, and everything in between, the Clubhouse has been refurbished. Most noticeable of the Clubhouse renovations is addition of a roof on the veranda overlooking the 18th green. Augustine has truly been returned to the Upscale Public Facility that golfers in the Mid-Atlantic remember from years ago. "Golfers will find a country club atmosphere awaits them from the bag drop to the impeccable conditions. This just may be the most beautiful and natural golf course you will ever play. The professional staff at Augustine looks forward to servicing your every need during your next visit," Ganse said proudly. While Jacobson allows you to rip the big dog from your bag fourteen times a round, he'll make you drive it straight, or pay the price. Hole #1 is a perfect example of the test. 406 yards from the back, the elevated tee shows a split fairway -- presenting the option of how to approach the green. Dead center is taken away by a wetlands area. The easiest approach to the green is through the left side of the 'Y,' but the landing area is fairly narrow. The right side is a little wider and allows for more error, but will leave a short to medium iron for the second over the wetlands area and a bunker in the front right. The 434 Par 4 12th features a dogleg left and an elevated fairway. 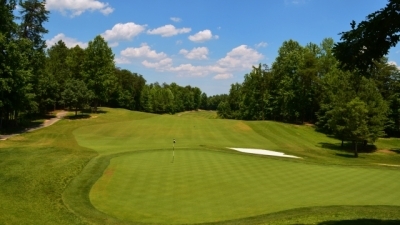 The second shot is into a downhill green that features a ridge directly in the middle, making the approach to the correct part of the green critical. The second hole is probably Augustine's signature hole (there are five or six outstanding potential choices). It's a 444 yard par four. Like #1, it requires a drive from an elevated tee to a fairway protected by water all the way down the left side, and a steep embankment to the right. Jacobson lets you drive it, but you'll have to determine from the tee how much distance you'll want to cut off from the second shot into a relatively small green. It calls for a steady nerve and sweatless palms to execute the shot. The sixth hole is a stunning par three. 196 yards from the back, it often plays into the teeth of the prevailing breeze. You'll have to hit over water, but the lake's more for scare than for real. There's enough room to miss left with a bunker, short, and right to make this a memorable hole for beauty and not for the beast. Make no mistake, par's still an excellent score, but the hole looks harder than it is. The back nine is less open than the front, and the trees seem to nestle more tightly against the fairways. The twelfth hole is the course's #2 handicap hole (the second is #1), but I'd say it's the toughest on the course. Measuring 434 yards from the tips, the tee shot is uphill to a plateau fairway, guarded by bunkers on the right. If you don't get enough distance, you won't be able to see the second shot -- which calls for a long iron into an elevated green. If you're to the right or short off the drive, even a layup shot must contend with a stream that bisects the fairway. Be glad when this one's over and move on. The relatively short par four 15th hole might temp some to go for the green from the tee. Jacobson gives you somewhat of a break with the fifteenth hole. Uphill and 300 yards from the back, it's not realistically driveable for 99% of us. But there's a big enough landing area to still use the driver comfortably, which will leave only a half sand wedge or variations of it into the green. There are two bunkers protecting the front right which could come into play if the pin is tucked in that region, and the green isn't very wide. But take advantage of this scoring opportunity when you get it. The round concludes with an uphill par five, reachable in two at 493 yards. You will have to have a strong tee shot in order to have a go at it -- and there's a large bunker guarding the front center of the putting surface -- and also one center-long. The green here is large for a par five, but its undulation will keep you honest. Even if your second shot makes the green, you still may be looking at par unless you're in the same vicinity of the flag. A fun hole to finish up the round. 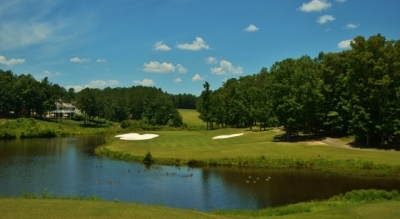 The final hole typifies the experience at Augustine Golf Club. First, it's fun. Second, it's creative, and provides choices. Third, play it aggressively, and you can make a birdie. Fourth, misplay it and you'll find a double on your card. Lastly, there's nothing confusing about it. Challenging but fair. A role model for a golf round. And just as Augustine Washington was a model for George, Augustine Golf Club's a model for public golf. Raspberry Golf Management is now managing the property. Rates include cart fees, range privileges (before play) and sales tax.